In the year 1993 Texas Instruments introduced a new design line that replaced both the TI-68 inspired look of the earlier TI-35X and the boxy design of the TI-30 Stat calculator. Dismantling the TI-35X reveals a novel construction based on a rubber keyboard pressing on a flexible printed circuit board (PCB) with an attached rigid board holding a Toshiba T6A58S single-chip calculator circuit. In the year 1996 this calculator was discontinued. Others like the TI-36X SOLAR survived in a new design. View it here. 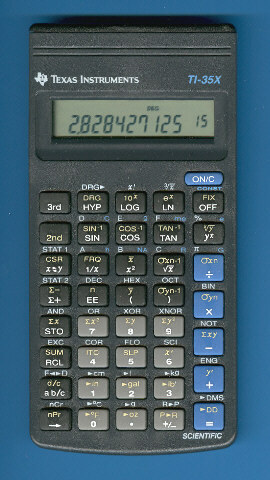 The TI-35X is featured in the Texas Instruments Incorporated sales catalog CL-1233 dated 1994.